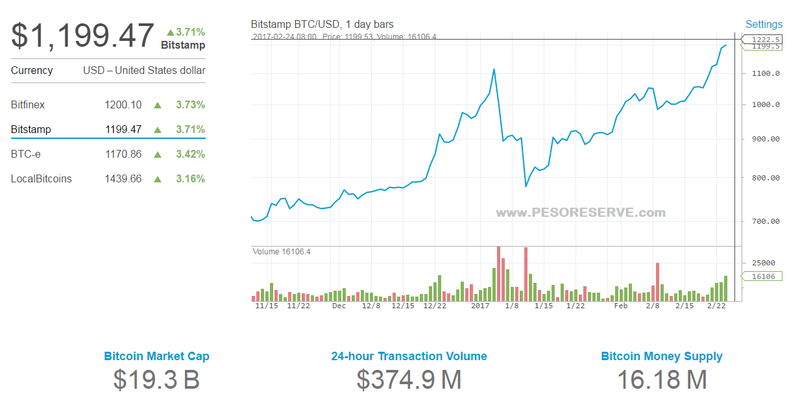 BTC/USD hit an all-time high of 1220 level on Friday and is currently trading at 1209 levels at the time of writing (Bitstamp). The recent upswing is possibly being driven by the upcoming decision on bitcoin ETF by the US Securities and Exchange Commission (SEC). Traders seem to be largely bullish on the bitcoin ETF getting the approval, CoinDesk reported. The SEC has until March 11,2017 to approve or disapprove the ETF. According to Bloomberg, President Trump’s policy uncertainties might be the reason behind the recent rally. It explains that investors are looking to hedge against potential global uncertainty in the wake of President Trump’s policies and are speculating relaxation of digital currency regulations under his leadership. On the upside, the pair will now run into resistance at 1245 (127.2% retracement of 1139.89 and 751.34) and a break above would see it testing 1280 (113% extension of 751.34 and 12.20)/1347. Momentum studies remain bullish. Any dips could be taken as an opportunity to go long. However, caution is advised as RSI and stochs are in the overbought zone. On the flipside, support is seen at 1200 (psychological) any violation would drag it to 1140 (trend line joining 941.81 and 1074.69)/ 1115 (5-DMA). A break below 5-DMA could see further weakness in the pair. DO YOU WANT TO START EARNING BITCOIN WITHOUT SPENDING EVEN A CENT? You must download the Coins.ph App below and register. This app would serve as your wallet to store your collected bitcoins. You must have a bitcoin wallet and bitcoin address through blockhain or at Coinbase.com You may download the Coinbase.com App below to begin. FOR Coins.ph Follow the steps 1 to 3 to get the Bitcoin address and save this as you need this address. 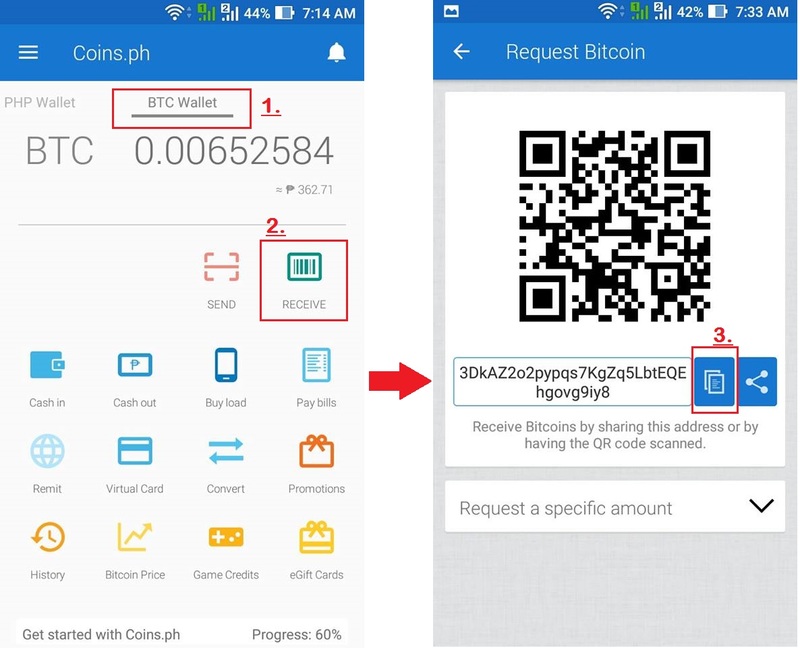 In order for you to have a new Bitcoin address using the Coins.ph , You must follow the 3 steps above as shown in the screen captured photo. 3DkAZ2o2pypqs7KgZq5LbtEQEhgovg9iy8 is a sample of a bitcoin address. Note: Coins.ph would ask you to download aswell the Google Authenticator as the second security verification to make sure that you are the owner logging into the account. Every time that the Coins.ph app would ask for verification, you must open the Google Authenticator as it would display a new code. Such code would change everytime you make a new transaction. FOR Coinbase.com if you could not find the button that would provide a new bitcoin address then proceed to blockhain, register and get your new Bitcoin address. With your bitcoin in your wallet, now you could start trading at live trading platform by joining the fast and easy simpleFX Bitcoin trading platform. . It is risky but if you want to take the risk and know how to see the trend up and down then you could make your $100 USD into $1,000 USD in just a day. The platform will provide you educational video tutorial if you are a n00b in currency and stocks trading.